Long before American television was saturated with CSI and Forensic Files, I was living my own weekly CSI adventure with my family in northern Michigan. My father was a medical examiner for three counties and my mother assisted as his office manager. They ran the office out of our home because the county was underfunded and could not provide him with one. Dad investigated an average of 100 deaths a year. Accidents, suicides, natural deaths, and scores of drunk driving fatalities filled Dad’s days and nights and kept food in the cupboards and clothes on our backs. During the 23 years Dad worked in forensics, I had a hands-on education in death investigation. It was as natural as brushing my teeth. One Sunday after church, when I was eight, my father toted us all over to the local airstrip. A small plane had crashed the night before and Dad wanted to return to the scene in daylight to scour the area for any remaining body pieces. My younger sister and I paired up to help him. Outfitted in our Sunday best, we roamed the damp field that early spring morning in search of brain matter and skullcap. And yes, we found some. One of the first times I remember my home life intersecting with my social life was third grade. A new friend came over to play in our fort in the barn loft and soon became intrigued by a 55-gallon barrel. She wanted to take a look inside, despite my strong discouragement. Eventually, she weaseled the truth out of me. I told her, “there’s a man’s leg in that barrel.” It thrilled her. I cowered as she peeled back that plastic and cross section of thigh stared back at both of us. By my senior year of high school I was a little more comfortable about letting people into the family business. My friends and I hosted a Halloween party for our senior class on our twenty acres of farm land. We designed a haunted hunt through the fields and woods with a scary viewing of Sam, our family skeleton, who was a real human skeleton that a doctor friend of my Dad’s bequeathed him. Sam lived in our barn and Dad stuck a cigarette between his teeth. He teased that Sam’s demise was lung cancer—one of his ploys to prevent us from taking on the deadly habit. During my freshman year of college, my best friend who was studying to be a nurse, would often assist my Dad with his autopsies. Her time in the morgue was superb training for a nursing career. One weekend I came home from college to find my friend sitting on the front porch with several buckets of decaying human parts soaking in bleach. My Dad had employed her to scrape the bones clean of flesh for a case he was investigating. After the bones were clean, they laid the skeletal remains on the lawn and reconstructed the body to figure out what pieces were missing. When I started writing I began to tap into my past and discovered that I was drawn to crime stories – from Hitchcock to Fargo to Breaking Bad to Bones. Writing crime challenged me in ways others genres could not. It is an intense workout for both the left and right sides of your brain. The discovery that I loved this genre surprised me because until this point, I was not a CSI fan and rarely read crime novels. Now, suddenly, I felt deeply connected to my past. And I wanted more! I wanted to know everything. I hounded Dad and Mom with phone calls, e-mails, and questions. I read books, articles, blogs! Mine was a literary bloodlust. To satiate it, I attended the Forensic Science Academy. 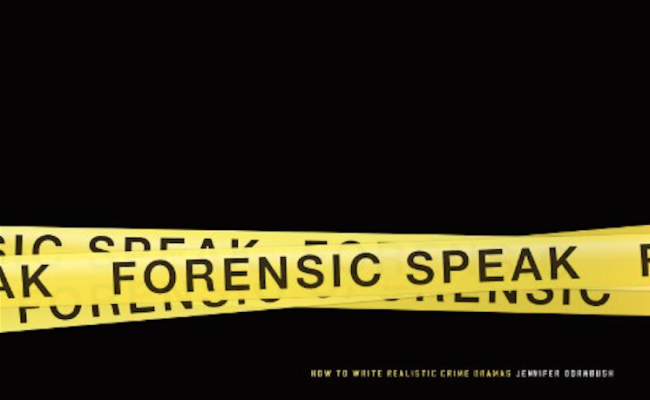 From this experience my non-fiction book, ‘Forensic Speak’, was born and continues to be used by writers, professors, and law enforcement alike. I began speaking about forensics to empower other storytellers with the treasure trove of experiences and knowledge from those decades of death investigation in my family’s home. I kept writing, studying, and drawing from my past. The Coroner novel is one result of that. And there are many more to come! So, please come join me for a forensic family’s dinnertime. Take a seat. Pass the corn. And enjoy a taste from the coroner daughter’s table. 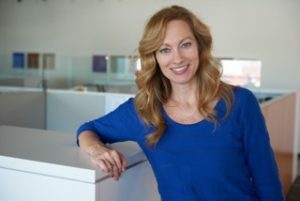 Jennifer Dornbush is a writer and speaker who scribes for film, TV, and novels. She has several crime drama series and a kid’s show in development. She recently adapted a YA novel for film, and her feature film ‘God Bless the Broken Road’, is slated for release September 21, 2018. Jennifer is also a forensic specialist. As a daughter of a medical examiner, she investigated her first fatality, when she was 8 years old. 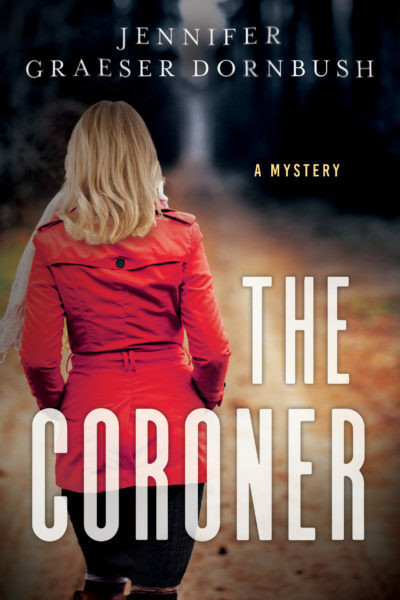 She is author of ‘Forensic Speak: How To Write Realistic Crime Dramas’, and her first mystery novel, ‘The Coroner’, is releasing in August. 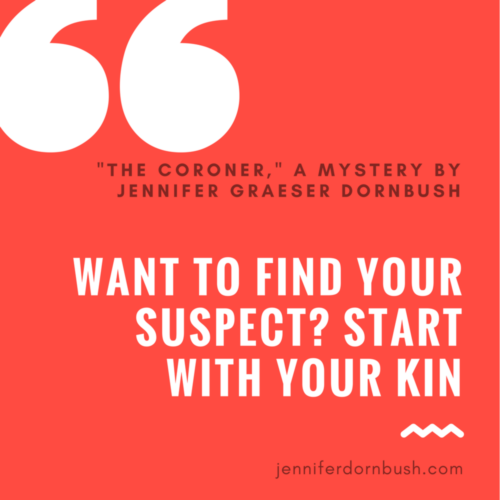 Jennifer frequently teaches seminars and speaks on writing crime fiction for screen, forensic fundamentals, and death investigation. She also hosts a YouTube channel: Forensic Fridays. She loves to mentor aspiring writers and is a member of the Writers’ Guild of America, Sisters in Crime, and the Mystery Writers of America. You can learn more about Jennifer and her work on her website.